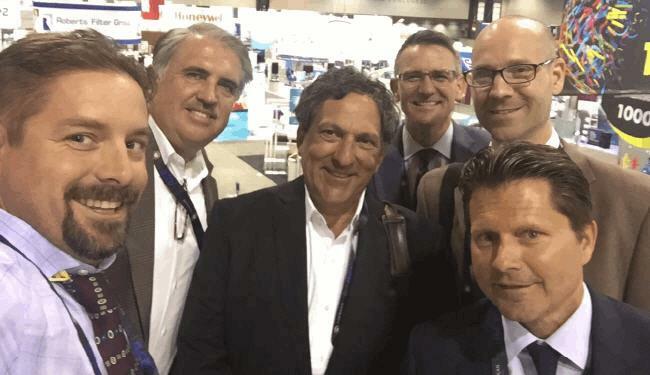 This year's Annual Conference and Exposition (ACE16), held by the American Water Works Association (AWWA) from June 19 to 22, was the first following the tragedy of Flint — a time when the drinking water industry is under intense scrutiny. Despite the recent negative headlines, and perhaps because of them, AWWA CEO David LaFrance lauded the great work of treatment plant operators during his Opening General Session address, rightfully acknowledging their excellent track record of providing clean water to the masses and protecting our environment. While LaFrance's optimism and praise was meant to contrast the bad press, the positive and negative narratives are common in that they underscore just how critical operators are to society. 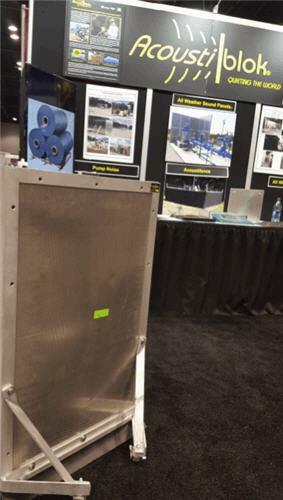 This was top of mind as I walked the sprawling show floor in Chicago's McCormick Place, featuring thousands of exhibitors and products geared toward aiding the operator and advancing water treatment. From my tour of booths and discussions with key industry figures, here are 10 technologies, services, or breakthroughs that most impressed. No single technology that I came across provided such a “wow” factor as this — a service that can find a given municipality's pipeline leaks from space, all at once. Thousands of square miles can be covered with satellite snapshots that can identify leaks with accuracy from 6 meters (20 feet) of occurrence, according to results from a pilot program run in Melbourne, Australia, in December 2015. 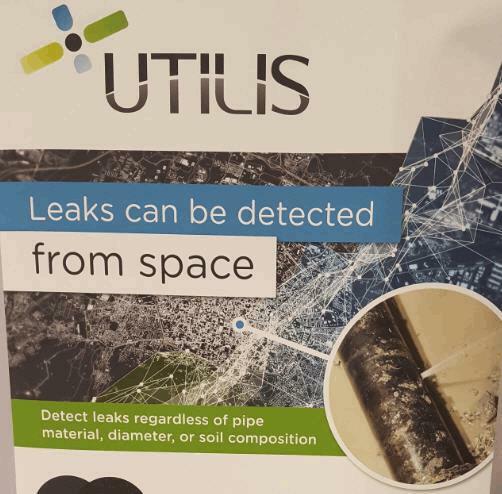 A partnership with Hydromax USA has brought the Israeli startup technology from Utilis to the U.S., enabling pipeline condition assessment without the time and on-the-ground resources typically reserved for conventional survey methods. The size of the leak is also detectable, allowing utilities to prioritize maintenance. No hardware installation or infrastructure changes are required to enable the assessments, which can be sent monthly, quarterly, or at intervals based on budget or labor allocation. Algal blooms and the resulting cyanotoxins — responsible for a water system shutdown in Toledo, OH, in 2014 — are among today’s greatest water quality challenges. Created by excess nutrients in surface water and abetted by warm temperature conditions, algal bloom conditions are becoming more prevalent and increasingly regulated. Drinking water treatment can protect consumers from toxins at the tap, but a watershed approach is preferred, sometimes mandated, to additionally protect aquatic life and preserve the recreational and environmental benefits of surface waters. The SonicSolutions Algae Control device floats in water and emits ultrasonic waves that inhibit the growth of algae and the formation of blooms. It runs on DC power (or solar option) with a battery pack, and is available in a range of models to cover areas up to 8 acres with a single device. While the above technology creates (inaudible) sound waves, Acoustiblok specializes in reducing the very loud variety of sounds emanating from treatment equipment, specifically pump systems. 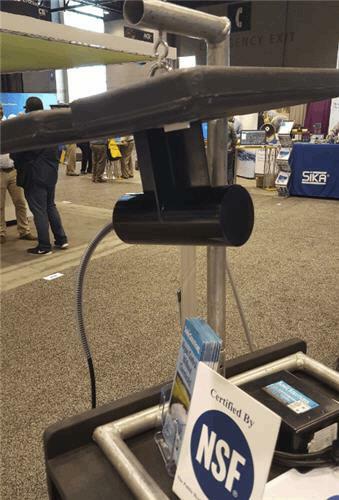 Demonstrated on the show floor with a loud radio completely silenced when covered by Acoustiblok material, the low-tech appearance of the solution belies its impressive capability. Sounds don’t bounce off of the panels; rather, they are absorbed by them. 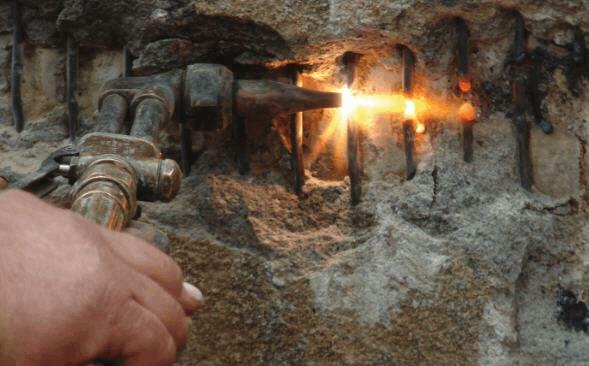 The company cites lab results certifying that 3 mm (1/8”) of its advanced material — a proprietary viscoelastic polymer with high-density mineral content — is as effective as 12” of poured concrete at reducing sound. They are also weather-proof, able to resist water, sun, salt air/water, chlorine air, harsh chemicals, chlorine air, corrosion, and hurricane winds at or above 270 mph, which is essentially the strength of an F5 tornado. Not all of my discoveries were made by ogling displays; some came from meetings with innovative industry leaders such as Trevor Hill, CEO of FATHOM. He explained how the FATHOM business model is a game-changer for utilities, whereby a municipality can have advanced metering infrastructure (AMI) put into place and realize fast payback by reducing costs and increasing revenue through meter data management and economies of scale. The unique aspect of the FATHOM solution is that it streamlines heretofore disparate functions of meter reading and billing — software, databases, business practices, and equipment — thereby enabling new optimization opportunities. FATHOM also has built-in expert data analysis and leverages industry partnerships to ensure proper implementation, best business practices; all to realize the full spectrum of ‘smart grid for water’ benefits — in the utility office, throughout the distribution system, and with customers. For years the water/wastewater industry has been lamenting the loss of experienced operators, who seem to be retiring all at once. Often these operators are not replaced due to trimmed municipal budgets, or automated systems are employed to fill the void. While many plants can “get by” on a day-to-day basis, there are certainly times when expert operators are in demand — just not available. WaterTALENT, the brainchild of aquaTECTURE President and CEO Devin Sloane, provides the required expertise through its network of highly qualified operators who will show up on-site to handle short-term, specialized jobs. WaterTALENT does the work of vetting and certifying the operators, as well as matching and deploying the operator to utilities, engineering firms, or other agencies in need. On-demand job functions include plant supervisor, facility superintendent, general manager, senior plant operator, and lead shift operator. In meeting with the aquaTECTURE team, Sloane and company stressed the financial earning power for those who join the network, as well as other benefits — best summarized on their website, segmented for operators and clients. From left, aquaTECTURE’s Colter Andersen and Robert Bowcock, followed by Robert Neville (public relations), Guy Carpenter, yours truly (the bald one), and Devin Sloane. I also encountered on-demand solutions of an equipment nature, namely the Impro FAST mobile treatment unit announced at ACE16 by Pall Corporation, which specializes in separation and purification technologies. Developed in partnership with Desalitech Corporation, inventors of Closed Circuit Desalination (CCD) reverse osmosis technology, Impro FAST units (as the name implies) are designed for fast setup; they are particularly ideal for water-scarce and emergency situations that demand clean water — even drinking water quality — from a variety of source waters. 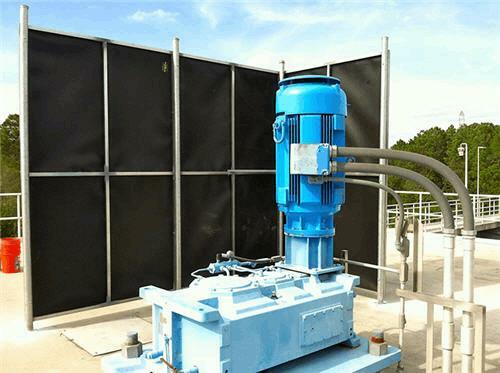 The most common market application may be for pop-up industrial water treatment, with flexibility for short-term or long-term/permanent use. According to Lisa Marchewka, VP of global strategic marketing for Pall’s water division, the units are also affordable and easy to operate — a solution suitable for any water, anytime, anywhere. Partnerships, collaborations, and acquisitions — or companies discovering synergies, to use the buzzword — are seemingly on the upswing in the water space. Forterra Building Products (consisting of Forterra Pipe & Precast and Forterra Pressure Pipe, among other divisions) recently purchased ductile iron pipe manufacturer U.S. Pipe, enhancing their service capabilities. This includes a hotline number (800-445-1534) for 24/7 emergency consulting to owners, engineers, and contractors, whether or not you’re a current customer. Of course, you will become a customer if relying on Forterra’s segregated stock of pipeline material available for a quick fix — within hours, according to Jeffrey Killin, VP for Forterra Pressure Pipe, Power & Industrial — but this is a welcome, and perhaps most economical, option for time-sensitive projects. Time is of the essence in many water utility operations, particularly with regard to detection of drinking water contaminants. Instead of waiting weeks for culture tests, LuminULTRA’s 2nd Generation ATP provides results in minutes. Early detection allows for mitigation before microorganisms proliferate and do harm. The on-the-spot test measures total microbiological concentration, allowing for a complete and immediate analysis, whereas culture tests are performed off-site and narrowed to a specific microbiological concentration. 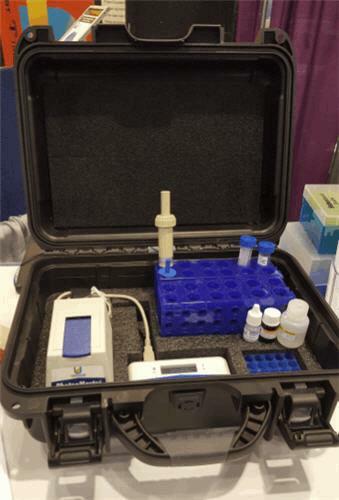 Contained within a portable, all-in-one kit, the testing process is simple to perform, yet technologically advanced. Results can even be entered via mobile device into a cloud-based analytics platform. In the ongoing effort to deliver quality water and protect public health, drinking water providers must strike the right balance of chlorine residual in the distribution system to banish microbial pathogens, yet guard against chlorine reactions with organic matter that can form dangerous disinfection byproducts (DBPs). This balancing act, with regulatory compliance at stake, is especially tricky at the end of the pipeline — as water sits, chlorine residual levels drop and the risk of DBPs increases. Flushing is required to return balance, safety, and compliance, but these tasks are only accomplished efficiently with intelligent analysis and performance. The Eclipse 9800i-GENESIS features a built-in amperometric chlorine analyzer (no reagents required) and automatically flushes uncirculated water to a storm sewer, sanitary sewer, or drainage ditch once chlorine falls below certain levels which are set via the programmable logic controller (PLC). All data is recorded and available to supervisory control and data acquisition (SCADA) systems, with capability to include additional parameters/sensors including temperature, turbidity, pH, and conductivity. Installed as a permanent system at distribution line dead-ends, the 9800i is weatherproof and self-powered, creating energy from a water turbine and 24DC battery bank. Full disclosure: I went into ACE16 without much knowledge of zeta potential and its correlation to coagulation and flocculation. 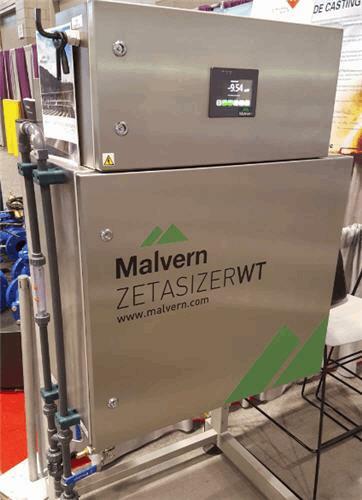 Perhaps that’s forgivable, as continuous online measurement of zeta potential is rare at water treatment plants, according to Malvern’s Ana Morfesis, PhD, a business development specialist focused on nanometrics. It’s heady stuff, but the upshot is that zeta potential directly quantifies the likelihood of coagulation by monitoring particle charge, with a “sweet spot” providing for optimal flocculation. The Zetasizer WT utilizes electrophoretic light scattering (ELS) to measure particle charge/zeta potential, which lets operators know if more or less coagulant is needed. Efficient clarification eliminates coagulant overdose, increases plant stability, and reduces sludge production, thus saving money. Traditionally, jar tests have been used for assessing clarification, but the technique is time-consuming and unreliable, and therefore not conducive to proactive process control. 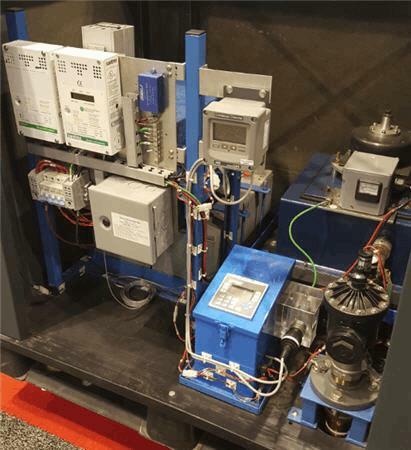 Streaming current meters (SCMs) can be installed online for continuous monitoring, but have poor sensitivity at low charge conditions and require calibration, unlike the ELS-enabled Zetasizer WT. The Zetasizer WT sensor has been successfully implemented by Severn Trent, with efficacy confirmed by Emma Sharp, Severn's water treatment and quality lead, who attested to coagulant cost savings of 22 percent along with 10 percent reduction in sludge. 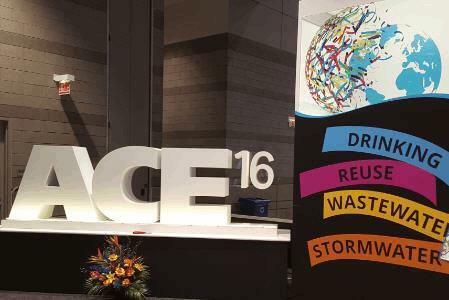 As always, ACE16 was a great learning and networking experience. If you didn’t find your product solution in the list above, consult the search at the top of the page or write to me at editor@wateronline.com to suggest topics for editorial coverage.